AQI was established by the American Society of Anesthesiologists in October 2008 to facilitate practice-based quality management through education and quality data feedback. Home to NACOR, the largest anesthesia registry in the country, AQI's vision is "to be the primary source of information for quality improvement in the clinical practice of anesthesiology. 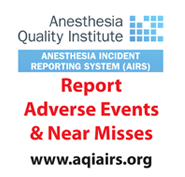 Through education and quality feedback, AQI will help to improve the quality care of patients, lower anesthesia mortality and lower anesthesia incidents." AQI is listed as a Patient Safety Organization (PSO) by the Department of Health & Human Services (HHS), ASA is a member of the National Quality Forum (NQF) and NACOR is a Qualified Registry (QR) and a Qualified Clinical Data Registry (QCDR).